When it comes to self care, many of us want to make a concerted effort to practice it more often. But where to start? And how can we be sure we’re spending our time on the activities that will have the biggest impact on our wellbeing? 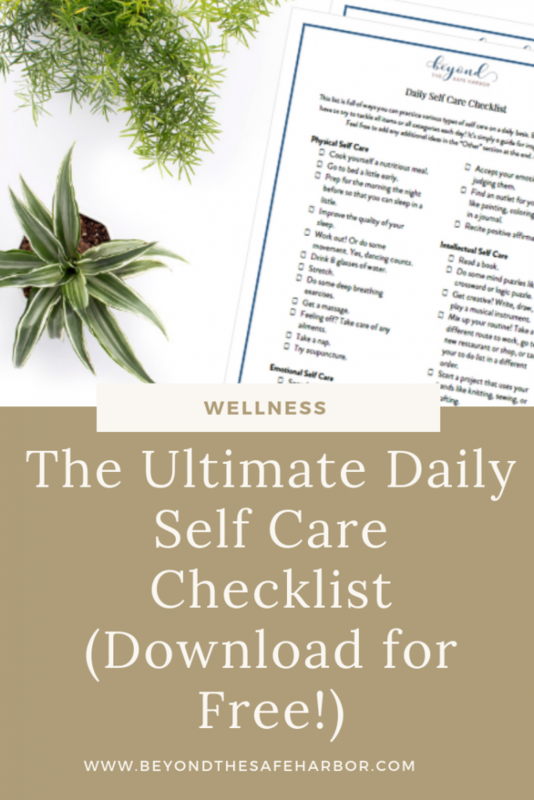 I’ve scoured a ton of resources and have come up with a daily self care checklist that I’m really excited to share with you today. 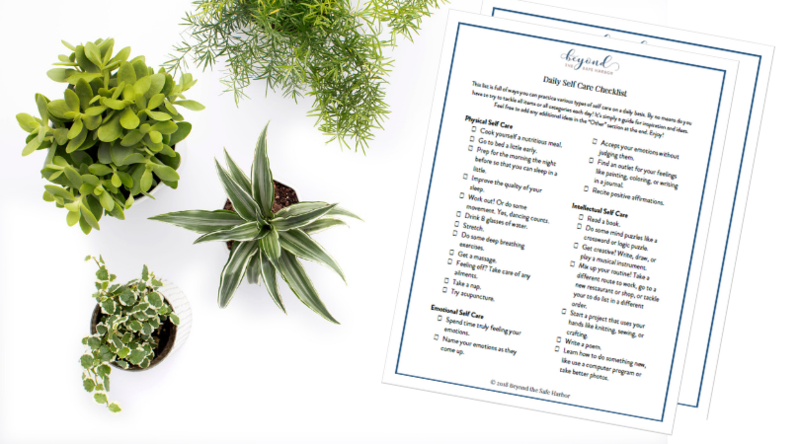 The self care ideas are all listed in this blog post, but you can also download a printable copy for free when you sign up for my Resource Library! Just enter your name and email address and you’ll get the link and password to log in. The checklist can be found in the Personal Growth and Development section of the Resource Library. Before diving in, you may want to first identify what type of self care you should be focusing on. My quiz, What Type of Self Care Do You Need? This Quiz Will Tell You can help with that! Take the quiz below. There’s no need to do all of these self care activities every day! The goal of this checklist is to give you ideas and inspiration as to ideas for each type of self care. Physical self care is about catering to our physical body and its health. Go to bed a little early. Prep for the morning the night before so that you can sleep in a little. Feeling off? Take care of any ailments. For more on physical self care, check out my post How to Start Practicing Physical Self Care: 5 Easy Ways. Emotional self care is about simply allowing yourself to feel your emotions for what they are. This involves identifying and accepting them with little to no judgement. Spend time truly feeling your emotions. Name your emotions as they come up. Find an outlet for your feelings like painting, colouring, or writing in a journal. And check out my post 5 Simple Ways to Practice Emotional Self Care Now for more ideas. Intellectual self care is about exercising your mind and can involve stimulating critical thinking, brainstorming, and creativity. Do some mind puzzles like a crossword or logic puzzle. Get creative! Write, draw, or play a musical instrument. Mix up your routine! Take a different route to work, go to a new restaurant or shop, or tackle your to-do list in a different order. Start a project that uses your hands like knitting, sewing, or crafting. Learn how to do something new, like use a computer program or take better photos. Listen to an educational podcast about something new to you. Spiritual self care is about connecting with your values and what really matters to you. It relates to who you are at your core. Donate money to a charity or non-profit organization of your choice. For more on spiritual self care, check out my post What Is Spiritual Self Care? How to Practice it Today. Social self care is all about connecting with others. Meet a friend, family member, or colleague for coffee. Help someone, even if that means just keeping them company while they run errands. Go out in public to just be around people. The energy can be contagious! Volunteer. My post Giving Back to Society: How to Make a Difference Now has some ideas. Go on a date! My posts 22 of the Best Inexpensive Date Ideas to Try This Weekend and 10 of the Most Fun Date Night Ideas for Married Couples have lots of ideas. There you have it – 39 self care practices you can try today! Don’t forget to download your FREE printable today. Looking for more healthy habits? Check out my post The Ultimate Healthy Habits List to Improve Your Life.